Manage and categorize your digital photos. You can add your photos to different categories and write a comment to each photo. Each photo is shown as thumbnail in the preview. You can view and print your photos in full quality. Distribute the photos and the album files on CD. Or create a slide show out of your photos. Many different fade in and out effects make be used. To create a pdf photo album ebook you can use our PDF Photo Album. With our program Photo-Printer you can print out your photos - many photos placed on one page. 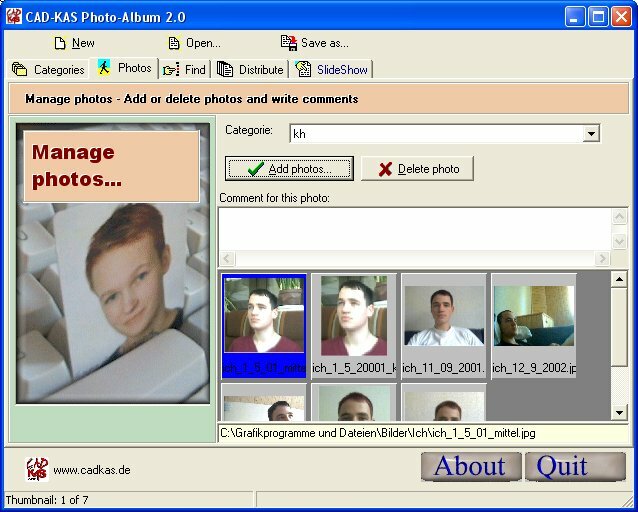 If you need to create a computer photo slideshow or a video/dvd slideshow use our software SlideShow. To edit photos you use our Photo-Retouch. Photo-Album has got a 4 stars rating on softlist.net.